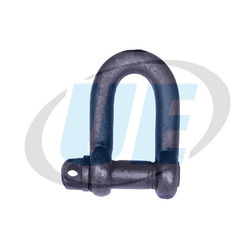 Leading Manufacturer of d shackle screw pin type and electric hoist from Ahmedabad. Size 1 TON TO 40 TON CAP. We are offering D Shackle Screw Pin Type. 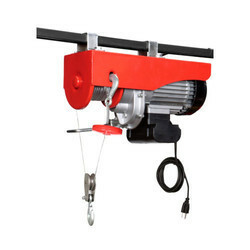 We have marked a distinct and dynamic position in the market by providing a high quality array of Electric Hoist. A hoist can be built as one integral-package unit, designed for cost-effective purchasing and moderate use, or it can be built as a built-up custom unit, designed for durability and performance. The built-up hoist will be much more expensive, but will also be easier to repair and more durable. Package units were once regarded as being designed for light to moderate usage, but since the 60s this has changed. Built-up units are designed for heavy to severe service, but over the years that market has decreased in size since the advent of the more durable packaged hoist. Lifting height : Upto 25 mtrs. Motion : Up-Down (Hoisting motion) & To-Fro (Cross-Traveling motion) by 3 phase Sq. cage crane duty motors. Safety Features : Limit switches to prevent over-hoisting & over-lowering.